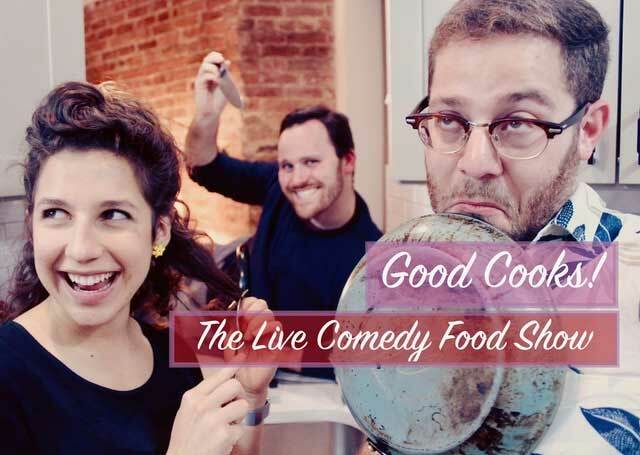 The Tank (Meghan Finn and Rosalind Grush, Artistic Directors) will present the live comedy show for food lovers, GOOD COOKS! created by Deby Xiadani, Alec Ring, and Luke Katler at The Tank (312 West 36th Street between 8th and 9th Avenues) on Tuesday, January 22 at 9:30pm, Tuesday, February 12 at 9:30pm, Thursday, March 14 at 9:30pm, and Thursday, April 18 at 9:30pm. Runtime is 1 (delicious) hour. Tickets ($10) are available for advance purchase at www.thetanknyc.org. GOOD COOKS! is a monthly sketch comedy show all about food. Each month, we invite two amazing guests who work in the world of food. We interview them about their passions and their work and help them plan AUDIENCE TASTINGS and LIVE DEMONSTRATIONS. Between interviews, original comedy sketches keep the atmosphere upbeat and energized. We’ve featured chefs, small business owners, social media influencers, publicists, sommeliers, and more. The show was born out of our shared love of food, comedy, and creating a sense of community for our audience. Alec Ring (Director/Writer/Producer) is a director, writer, and producer with training at UCB and Improv Olympic based in New York. After living in Los Angeles, Alec moved to New York to begin working at Cinetic Media – a full service sales, finance, management, and production company in film and television. Most recently, he has assisted with the production of Ethan Hawke’s Blaze which premiered at Sundance 2018 and Peter Farrelly’s Green Book starring Viggo Mortensen and Mahershala Ali. Luke Katler (Director/Writer/Producer) hails from sunny south Florida where he spent his days staring longingly at the beach from a darkened room watching 90s comedies. Luke works at Barbara Whitman Productions as Barbara’s Associate Producer, where he helps shepherd plays and musicals to the Great White Way. Luke has spent his life as a performer and director in everything ranging from Shakespeare, musical theatre, and improv comedy at Chicago’s Improv Olympic. 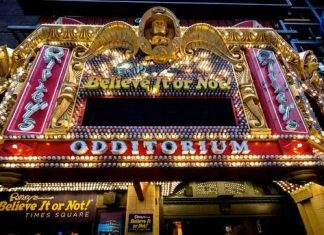 On any given day or night you can likely find Luke at the theatre or huffing and puffing on a strained run along the Hudson. He has strong opinions about the most authentic Italian cuisine in New York, so just don’t even bring it up. For your own sake. Trust him on this. The Tank is a non-profit arts presenter serving emerging artists engaged in the pursuit of new ideas and forms of expression. We serve over 2,000 artists every year in over 400 performances, and work across all disciplines, including theater, comedy, dance, film, music, public affairs, and storytelling. Our goal is to foster an environment of inclusiveness and remove the burden of cost from the creation of new work for artists launching their careers and experimenting within their art form. The heart of our services is providing free performance space in our 98-seat proscenium and 56-seat blackbox that we operate in Manhattan, and we also offer a suite of other services such as free rehearsal space, promotional support, artist fees, and much more. We keep ticket prices affordable and view our work as democratic, opening up both the creation and attendance of the arts to all.